Whenever it comes to big budget items a few names come to mind: Patek Philippe, Herman Miller, I could go on- But I didn’t pick both names out of a hat at random, I’m thinking long term, I’m thinking heirloom. 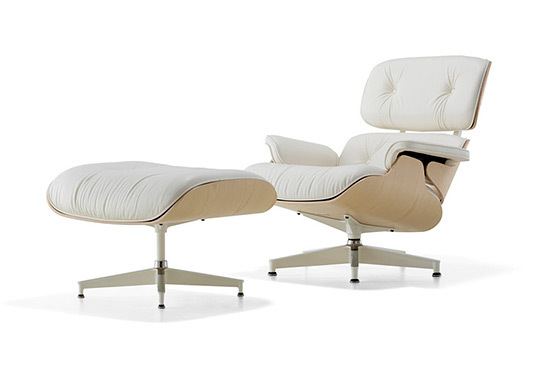 Let me put it this way, the Eames Lounge and Ottoman have been around since the retrotastic 60s and the fact that it’s still around and now updated in a never before seen white ash colour scheme makes it all the more attractive. When Herman Miller started making the Eames Lounge Chair and Ottoman in 1956, they didn’t realize they would not only have an instant hit on their hands, but also create a cult and culture following that have made two once humble (and now infinitely imitated) pieces of ubiquitous lounge furniture into a work of art. Opulent and elegant, the Eames Lounge and Ottoman have become a must-have living room accessory for luxury aficionados. Yes Jeeves, Keep me informed.